Stone, siding, and multiple gables combine beautifully on the exterior of this hillside home with walkout basement. Taking advantage of rear views, the home's most oft used rooms are oriented at the back with plenty of windows. Augmented by a cathedral ceiling, the great room features a fireplace, built-in shelves, and access to the rear deck. Box bay windows enhance the breakfast room and master bedroom, while the dining room, bedroom/study, and master bedroom and bath enjoy tray ceilings. Twin walk-in closets and a private bath infuse the master suite with luxury. The nearby powder room offers an optional full bath arrangement allowing the study to double as a bedroom. Downstairs, a large media/recreation room with wet bar and fireplace separates two more bedrooms, each with full bath and walk-in closet. 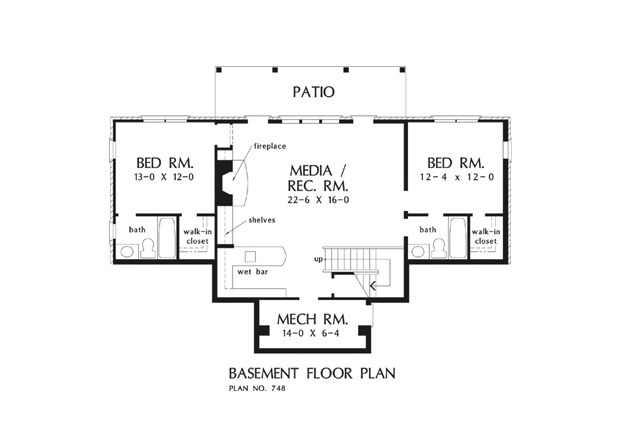 1st Floor: 2065 Sq. 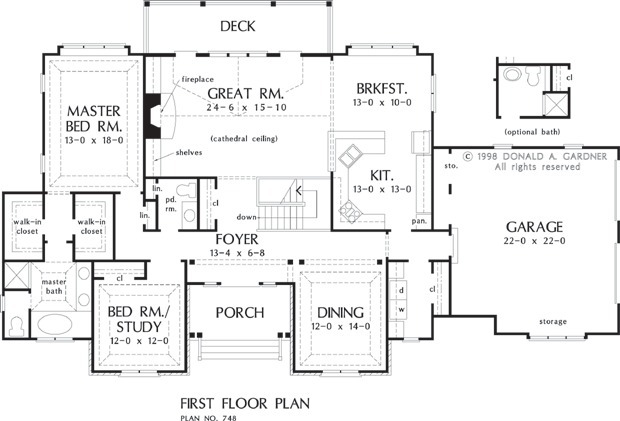 Ft.
House Dimensions: 81' 10" x 43' 4"
Great Room: 24' 6" x 16' 0"
Foyer : 13' 4" x 6' 8" x 9' 0"
Great Room (Cathedral): 24' 6" x 16' 0" x 15' 6"
Utility Room : 5' 8" x 10' 0" x 9' 0"
Garage Storage : 16' 0" x 2' 10" x 0' 0"
Bedroom #2 : 13' 0" x 12' 0" x 9' 7"
Bedroom #3 : 12' 4" x 12' 0" x 9' 7"
Porch - Front : 13' 8" x 7' 4" x 0' 0"
Deck / Patio : 25' 0" x 7' 0" x 0' 0"
Deck / Patio #2 : 25' 0" x 7' 0" x 0' 0"
Media Room : 22' 6" x 16' 0" x 9' 7"
Storage (Other) : 2' 0" x 10' 8" x 0' 0"
Other : 14' 0" x 6' 4" x 0' 0"
Other #2 : 6' 10" x 6' 8" x 9' 0"